Arsenal brought in a new manager after Arsene Wenger decided to leave the club at the end of last season. Unai Emery was appointed as a new man in charge, and along with him, some new players were bought to strengthen the squad in key areas. Young Matteo Guendouzi has already shown signs of promise while Bernd Leno is starting to prove as to why he is regarded as one of Europe's best young goalkeepers. However, there is one player who has been superb since his arrival at Arsenal, and that is Lucas Torreira. The Uruguayan was fantastic for his national team during the World Cup. The North London side succeeded in landing the 22-year-old for a fee worth £26 million from Italian club Sampdoria, pipping several other teams to the youngster's coveted signature. Emery was initially a tad cautious when it came to handing regular playing minutes to the midfielder. 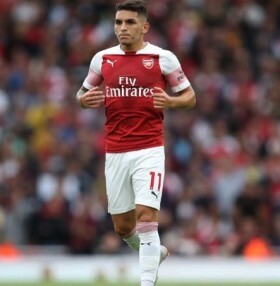 As a result, Torreira had to be content with playing second halves of games and making at impact from the bench. The Uruguayan finally started his first game against Everton two weeks ago and impressed. His ground-covering ability as a defensive midfielder is immense, especially for a team like Arsenal that plays front-foot football. In such cases, a proper shield in front of the back-line is a necessity. And because of Torreira’s presence, Granit Xhaka is playing better since Swiss comfortably makes the ball talk rather than worrying about covering the space between the lines. Torreira’s performance against Fulham on Sunday raised more than a few eyebrows in a positive manner. During the last decade or so, there was a lingering debate about Arsenal’s requirement for a proper defensive midfielder. From what we have seen of Lucas Torreira thus far, don’t be surprised if he becomes the player who becomes a key part of the Gunners’ squad in the future.